Reeves, R. and E.d. Mitchell. "Dolphin and Porpoise". 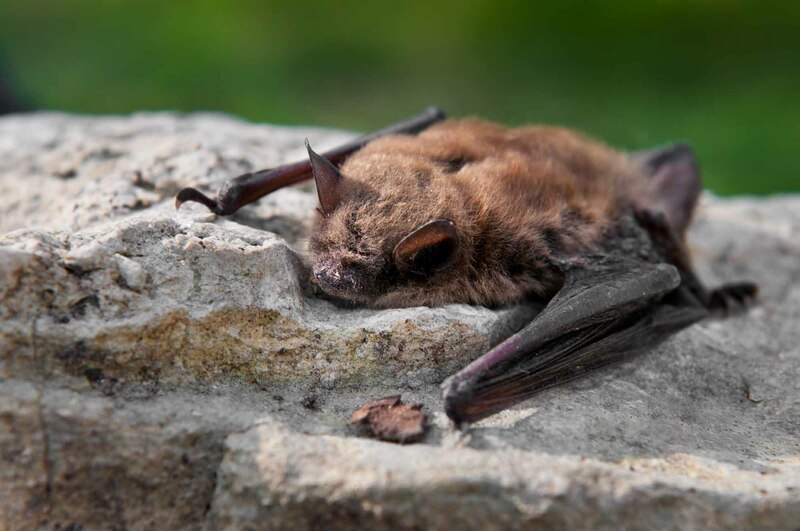 The Canadian Encyclopedia, 24 July 2015, Historica Canada. https://www.thecanadianencyclopedia.ca/en/article/dolphin-and-porpoise. Accessed 24 April 2019. Dolphin and Porpoise, are the common names for small, toothed mammals of the order Cetacea which also includes whales. White-beaked dolphins range between Cape Cod and Davis Strait in the Arctic Archipelago (Macmillan Illustrated Animal Encyclopedia). Dolphin and Porpoise, are the common names for small, toothed mammals of the order Cetacea which also includes whales. 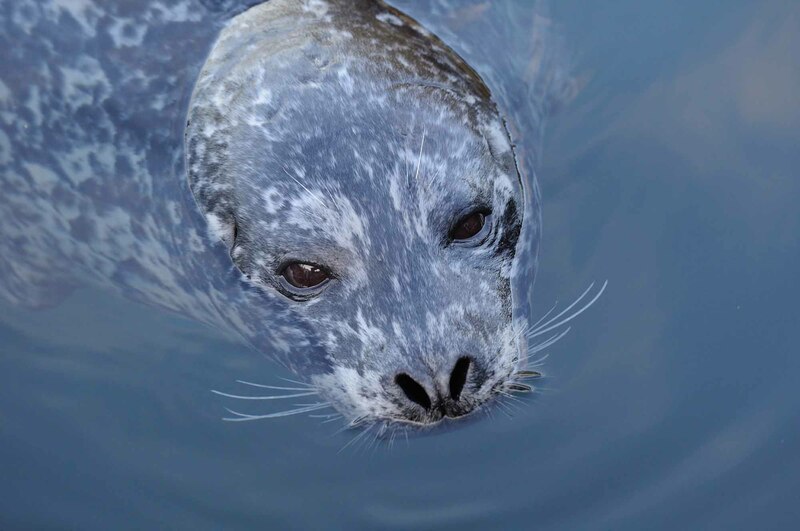 They are known from all oceans and many major river systems. In N America dolphins, with long snouts, are distinguished from porpoises, with blunt heads, but the terms are sometimes applied interchangeably to many small toothed whales, including members of the families Delphinidae, Phocoenidae, Stenidae and Platanistidae. 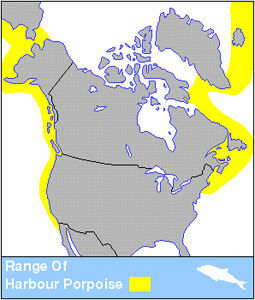 Five species are common in Canada. Harbour porpoise (Phocoena phocoena) is especially abundant in the lower Bay of Fundy, parts of the Gulf of St Lawrence and along the west coast. This, one of the smallest Northern Hemisphere cetaceans, has a relatively high metabolic rate and a short life span (about 13 years). Unlike some dolphins and porpoises, it does not live in large social aggregations, nor does it normally engage in aerial displays. 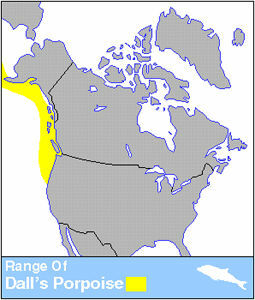 Dall's porpoise (Phocoenoides dalli), native to the N Pacific, occurs along the BC coast. 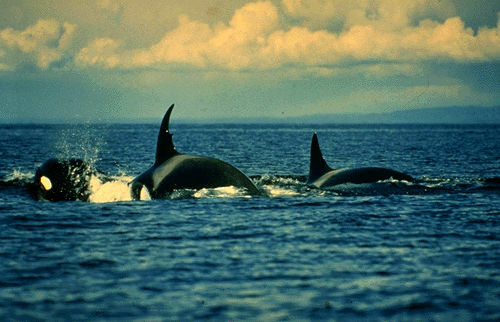 Its colour pattern is reminiscent of the killer whale (Orcinus orca) which, at 9.5 m and 8000 kg, is the largest delphinid. Three species of temperate-region dolphins occur in Canadian waters; all are gregarious and sometimes acrobatic. 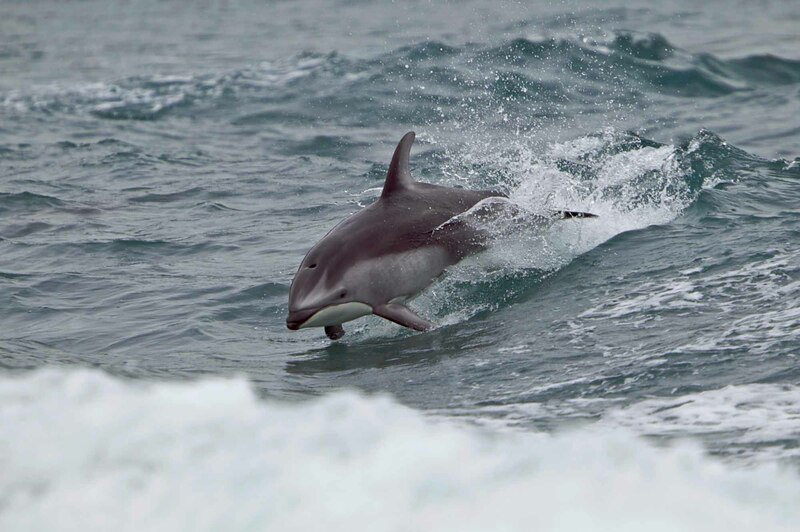 White-beaked dolphins (Lagenorhynchus albirostris) and Atlantic white-sided dolphins (L. acutus), both endemic to the N Atlantic, have overlapping ranges between Cape Cod and Davis Strait. 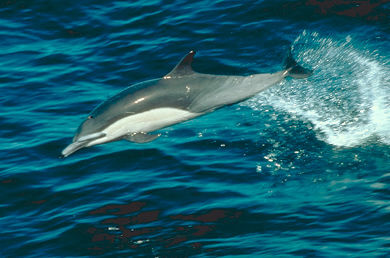 Their N Pacific relative is the Pacific white-sided dolphin (L. obliquidens). The bottlenose dolphin (Tursiops truncatus), popular in animal exhibits, generally does not range into Canadian waters. Most captive specimens come from Florida or the Gulf of Mexico region.